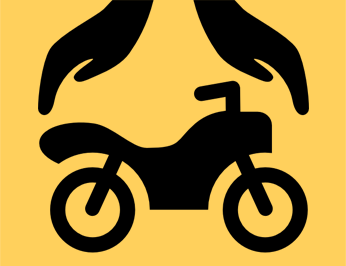 Two WheelerInsurance gives protection to the vehicle owner against. (ii) pays for any Third Party Liability determined as per law against the owner of the vehicle. Which Two Wheeler Insurance to Buy? The Sum Insured under a Two Wheeler Insurance policy reflects the value of the Two Wheeler vehicle determined based on the concept known as Insured's Declared Value. Insured's Declared Value is the value arrived at based on the Manufacturer's present value and depreciation based on the Age of the Vehicle. Coverage is as per requirements of the Two Wheeler Vehicles Act, 1988 . Compulsory Personal accident cover for owner-driver is also included. Policy can also be extended to cover various other risks like Personal Accident to occupants of vehicle, Workmen's Compensation to Driver, etc over and above the cover available to him under statute. IDV or Insured Declared Value is the market value of the two-wheeler at the time of purchase of the policy, based on which the sum insured is decided against theft or accidental damages. No Claim Bonus or NCB is the reward a two wheeler policyholder gets during the renewal of policy in the form of a premium discount. This bonus can only be availed if no claim was made in the previous policy period. How to make claim in Two Wheeler Insurance? What are the benefits of long term policy? Helps you avoid third party premium rate hikes and increase in service taxes that occur almost every year, making sure that you don't face an increase in expenditure during the policy period. In case of a claim during your policy period, the No Claim Bonus (NCB) reduces but does not become nil, unlike in the case of a regular two wheeler annual policy. Proportional refund provision even after a claim during the policy period. How to buy Two Wheeler Insurance online? Buying a two-wheeler or bike insurance online is an easy procedure. One can simply visit policyworld.com, compare the quotes and go to the buying process, fill all the necessary details, choose the policy period - two or three years and then proceed to buy. The payment for the policy can be made using a credit card, debit card, net-banking or digital wallet. How do I renew my Two Wheeler Insurance? You can renew your Two Wheeler Insurance policy online or offline - whichever is convenient for you. All you need is your previous Insurance copy and registration certificate and you are good to go. In how much time can I expect to receive my Two Wheeler Insurance policy copy? As soon as the payment is verified and the policy is issued, you will get an email from the respective insurer with your Two Wheeler Insurance policy copy. Can I transfer the ownership of my policy to someone else? If so, How? If you are selling off or giving away your Bike, it makes sense to transfer the ownership of your Two Wheeler Insurance policy as well. You simply have to hand over all the related documents to the new owner and inform the Insurance company and RTO about the same. Do note that the NCB accumulated by you during your ownership of the vehicle will not be transferred to the new owner. What happens if my policy expires?